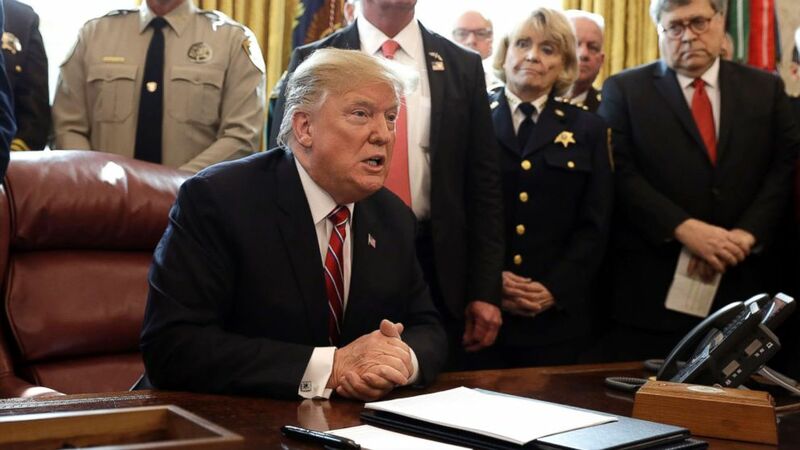 President Trump on Friday said he doesn't consider white nationalism a rising threat across the world but sees the problem as contained to a "small group" of people. "I don't, really. I think it's a small group of people that have very, very serious problems," President Trump said in response to a question from ABC News' Terry Moran in the Oval Office Friday. The president's comments come on the heels of a deadly attack in New Zealand that targeted Muslims in worship at mosques and left 49 dead and dozens more injured. The president has strongly condemned that attack as an "evil" and "monstrous terrorist attack." In his exchange with Moran, the president went on to qualify that the ideology of white supremacy may have been a factor in the New Zealand attack, which he said he continues to learn more about it. "I guess if you look at what happened in New Zealand perhaps that's a case, I don't know enough about it yet, they're just learning about the person and the people involved but it's certainly a terrible thing, terrible thing," Trump said. The Southern Poverty Law Center, which tracks hate crimes and groups in the US, has reported the number of hate groups in the US has been on the rise for four straight years and has recently reached an all-time high. The president said he spoke with the New Zealand Prime Minister Jacinda Ardern earlier on Friday and that he expressed the sympathies of the nation and resolve. Asked during a news conference in New Zealand if she agreed with the president's belief that white nationalism is not on the rise, Ardern offered a one word reply: "No."